‘Double celebrations’ are in order at Chichester Free School after it retained its ‘good’ Ofsted rating and appointed a new principal. Louise New, who has been assistant head teacher since 2016, will replace interim principal Jenny Clough in September. Mrs New said she was ‘absolutely delighted’ to have been appointed. She added: “I have been fortunate enough to work here for a number of years with wonderful children and a team of staff who are dedicated to ensuring all our pupils are happy, successful and achieve their full potential. Originally from the Midlands, Mrs New said she went to university and completed her teaching qualifications in York, before moving to the South East where she has been teaching for ten years. Speaking to the Observer about her new role, Mrs New revealed she first came to Chichester Free School ‘for the excitement of building something new’. She added: “I was head of English at St Petersfield School before moving to Chichester Free School in 2014 in the same role. 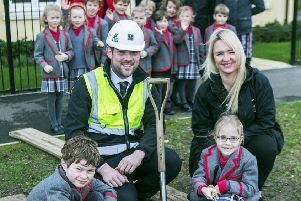 Having now moved into its permanent site in Hunston Road from September 2018, Mrs New said she was delighted with the school’s progress in education despite being in temporary sites in Vinnetrow Road since 2013. The area’s only all-through school scored a rating of ‘good’ in all areas and Mrs New said she will now be aiming for outstanding. The report states that, ‘across the school, the curriculum is based on carefully thought-out aims, which support leaders’ high aspirations for what pupils can and should achieve’. It added: "Leaders have sustained their high aspirations and moral intent as the school has grown. They have not allowed the challenge of moving to a new site to detract from their core purpose. Consequently, standards in the school remain high and are improving over time." Outlining where the school needs to improve, the inspector noted: "[It needs to] develop the precision of planning and use of resources, including staff, in early years, so that opportunities for learning are maximised. "[It also needs to] ensure that current school improvement work leads to pupils experiencing as consistently effective teaching across the wider curriculum, both in primary and secondary phases, as they currently do in their core subjects." “Ofsted was a really fair reflection of the school. It really celebrated the success we’ve had,” Mrs New said. Mrs New confirmed that the free school’s contract with the Bartons Road property ended on October 31, 2018, ‘so from November 1, the property went back over to West Sussex County Council and so is no longer linked to the school’. She added: “We have obviously had quite an interesting infancy with being on the temporary site for longer than we had expected but the Ofsted shows how well that has been dealt with. We have still been able to offer a really strong education. The new principal also highlighted her intention to ‘really build on the all-through model’. “The children can arrive at four and leave when they’re 18. That’s so unique and it was the main reason this school began,” she said. "We are looking at ways we can work with both sets of staff to have crossovers and bring parents and pupils together. There are things we can do to unite that education." Mrs New also provided an update on plans for the school Sixth Form, which opened in September. She said: “The sixth form started small but that was right for us. We wanted the right children to be in our sixth form. "It’s not right to have people doing A Levels when it’s not the route they should be going on. We’ve got a group of 18 children in our year 12s who are thriving. "Now it’s about growing that and we’ve got a really healthy number of applications for next year. We are aiming for 120 in each year group. It’s a very small cohort at the moment but it is looking like it will be a lot bigger next year." Commenting on the Sixth Form in the Ofsted report, the inspector wrote: "The new sixth-form is evolving well. Students are successful because teaching challenges them to deepen their thinking. "Leaders view strengths and improvement priorities accurately. Work experience and activities to support students’ attitudes and confidence are in the early stages of being introduced. "[To improve, it can] sustain the current quality of provision in the sixth form as it expands, so that academic standards are maintained and the wider aspects of the 16 to 19 study programme become established." Chichester Free School's move into the permanent site last year was a 'huge team effort', according to the new principal, who said she was was 'very involved' in the decision making. Mrs New said: "I was sat in architect meetings several years ago planning out rooms. It was an SLT team which included all staff but I was very involved in the decisions of rooming. "It was about looking at the bigger picture for the children and how they would navigate around the building and deciding on areas they can and can’t go. We are now refining the model for next year and how we can make the full use of the building." Mrs New also addressed concerns regarding traffic congestion and parking issues in Hunston Road. “We’ve been working closely with the local council and some of the issues are out of our hands," she said. "It’s a problem at a lot of schools. Some have residential areas when you can park but we don’t have that luxury. We’ve really worked hard to settle things down. and it's working a lot more smoothly as time has gone on. "We are always looking for solutions and we respond well to any concerns people have. It’s not perfect but it’s constantly something we are working on and looking to improve. "We have worked extensively with Stagecoach to make sure there are enough buses. Again, it’s been a big team effort. We’ve had a huge staff presence out on every exit point. "We have a staggered end to the day with a 3.30 and 4.30 pick up to help with the traffic and we’ve created a drive through area in the car park area of the site so we can take more cars off the road. "We have also really enforced car sharing in staff as well as parents and pupils. I car share, I don’t have my own parking space and we all adopt and live and breathe that model."